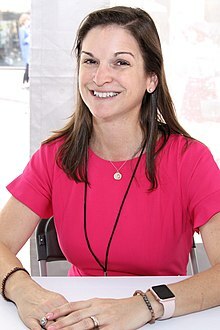 Sarah Dessen was born in Evanston, Illinois, on June 6, 1970. Dessen was born to Alan and Cynthia Dessen, who were both professors at the University of North Carolina, teaching classicism and Shakespearean literature. As a teenager, Dessen was very shy and quiet. She became involved with a 21-year-old when she was 15 but cut all contact with him shortly after. She has admitted in an interview that "for many years afterward, I took total blame for everything that happened between me and T. After all, I was a bad kid. I did drugs, I lied to my mom. You can't just hang out with a guy and not expect him to get ideas, I told myself. You should have known better. But maybe he should have. When I turned 21, I remember making a point, regularly, to look at teens and ask myself whether I'd want to hang out with them, much less date one. The answer was always a flat, immediate no. They were kids. I was an adult. End of story." She worked at a children's shoe store when she was in high school at Chapel Hill High School. She was fired during the annual summer sidewalk sale. Dessen attended Greensboro College in Greensboro, North Carolina, but dropped out not long after to enroll herself at the University of North Carolina-Chapel Hill, to take classes in Creative Writing, resulting in her graduating with highest honors in Creative Writing. Dessen waitressed at the restaurant Flying Burrito in Chapel Hill while launching her writing career. She would write during the day and waitress at night. She later went on to quit her job as a waitress after the publication of her first book, That Summer, which was published in 1996. Dessen's Along for the Ride made the New York Times Best Sellers List. Because of the publication of Along for the Ride, Dessen was now referred to as a "best-seller machine". Following the publication of Dreamland, Dessen taught at the University of North Carolina and wrote what would later become This Lullaby. Some of her novels have been among the ALA's "Best Fiction for Young Adults" selections: That Summer (1997), Someone Like You (1999), Keeping the Moon (2000), Dreamland (2001), This Lullaby (2003), Just Listen (2007), and Along for the Ride (2010).Someone Like You was also one of the two winners of the 1999 "School Library Journal Best Book" award, and Keeping the Moon was the sole winner the next year. In 2017, Dessen was awarded the Margaret A. Edwards Award for her novels Dreamland (2001), Keeping the Moon (2000), Just Listen (2007), The Truth About Forever (2004), Along for the Ride (2010), What Happened to Goodbye? (2011), and This Lullaby (2003). Most of Sarah Dessen’s novels deal with the change in youth’s personality as they go through some sort of tragedy or loss. The general themes that run through her novels are isolation, emotional distance amongst family members, and a progressive change in people’s personalities. 1996 – That Summer was the novel fixed upon teenagers living with changes they could not control. The moral of the story is to help influence the audience come to terms with their past, accept the present and look forward to the future. 1998 – Someone Like You was based on a true friendship that gets tested when life takes a turn for the worse. Halley and Scarlett have always been best friends but their friendship is tested when Scarlett's boyfriend is killed and she learns she is carrying his baby, which is when she needs Halley more than ever. 1999 – Keeping the Moon (also known as Last Chance) focuses on self-esteem issues that children experience when they are different from others. Colie has been bullied for being overweight but it takes others' kind words to help her realize she is beautiful inside and out. 2000 – Dreamland explores the life of Caitlin and her chaotic relationships between her family, friends and boyfriend. She eventually learns that, despite looking up to her, her older sister is not perfect, being her boyfriend's victim does not mean she is weak, and that being herself is the best thing she can do. 2002 – This Lullaby introduces us to eighteen-year-old Remy who learns to have faith. In the beginning of the book, she is afraid of taking chances because she is unsure of the outcome. Throughout the book she learns that sometimes you have to leap to take a risk, and she enjoys the rush that comes from the leaping. 2004 – The Truth About Forever is about a character going through the loss of her father. It takes her perception of the way her peers live their lives to understand that she was shutting herself out from the world and she wants to start living for her father. 2006 – Just Listen follows Annabel who seems to be the girl who has everything: a best friend, a good reputation and she models. After a misunderstanding between Annabel and her best friend, she loses everything and has to start the new high school year alone. This is when she meets Owen who helps her out of her comfort zone and reveal her true self. 2008 – Lock and Key introduces Ruby who was abandoned by her mother and sent to live with a family member where she learns the difference between being given help and being able to accept it. 2009 – Along for the Ride is focused on Auden, whose life starts to fall apart left and right and is losing her sense of direction. She forms a new bond with her baby half sister and takes her on many midnight walks where she learns that there is a whole other world out there when the rest of the world is sleeping. 2010 – Infinity (novella) is a short story about a girl who has to make tough decisions regarding her relationships and her life in general. She has to decide if she should fully solve her problems or just take a shortcut. 2011 – What Happened to Goodbye allows us to take a look at Mclean Sweet's life and why she would like to make things different. She lived in a small town with her family, when they found out her mother had been having an affair, and ever since all Mclean wanted to do was change the things about her life she didn't like, but couldn't do so easily because everyone knows everything in her hometown. 2013 – The Moon and More introduces Emaline who has lived in Colby her whole life with her 'perfect' boyfriend until she meets Theo, an ambitious outsider from New York, who thinks Emaline is too smart for Colby. He tries to convince her that she needs to leave Colby and move to where she fits in, but if she already has perfect, why would she want more? 2015 – Saint Anything shows us that Sydney's older brother, Peyton, used to be the star child of the family until he was involved in a drunk driving accident and everyone is worried about him while Sydney's the only one worried about the victim of the accident. It isn't until she meets Mac who makes her feel like she's noticed for the first time. 2017 – Once and For All is about Louna who thinks she has found her one true love until a tragedy separates them forever. She takes on a summer job helping brides plan their special day when she meets Ambrose, who just might be what she's been looking for all along. In 2017, Dessen was interviewed by Anna Gragert, a woman she had unconsciously influenced to become a writer. During the interview, Gragert asked Dessen about the style she uses in some of her books, otherwise known as "effortless perfection". Dessen describes this term as the young girls in her books being able to have friends, look good, be a good student and have your life together and make it look easy. At the start of the book, the reader is supposed to relate with the main characters and throughout their changes in the book, the reader should see that it is okay to not have everything together and not be perfect. Being an author herself, Gragert asked Dessen about her anxiety coping mechanisms because writing tends to cause an author to be anxious. Dessen said that she likes to exercise and read in her free time because all writers are going to be anxious, it's part of the process, but it also opens their mind more because they see the world differently than readers. They perceive everything more intensely which produces the anxiety, in most cases, but it helps them to be more aware. The 2003 romantic comedy-drama film How to Deal starring Mandy Moore, Allison Janney, Dylan Baker, Peter Gallagher and Trent Ford was based on both That Summer and Someone Like You. ^ "Sarah Dessen". TV.com. Retrieved 26 March 2010. ^ "Sarah Dessen: Biography". Puffin Books. Retrieved 26 March 2010. ^ "Sarah Dessen | Biography, Books and Facts". www.famousauthors.org. Retrieved 2018-04-03. ^ "I Thought Dating An Older Guy Was Cool — Until I Sensed That Something Was Very Wrong". 5 May 2015. ^ "Sarah Dessen Biography". www.oocities.org. ^ "Sarah Dessen | Biography, Books and Facts". www.famousauthors.org. Retrieved 2018-04-02. ^ "Best Sellers: Children's Paperback Books: Sunday, June 5th 2011". Retrieved 2018-04-28. ^ Schwartz, John (2009-08-13). "Novels for Teenagers by Sarah Dessen and Don Calame". The New York Times. ISSN 0362-4331. Retrieved 2018-04-03. ^ "This Lullaby – Sarah Dessen". sarahdessen.com. ^ "Best Fiction for Young Adults - Awards & Grants". www.ala.org. ^ "School Library Journal Best Book of the Year - Book awards - LibraryThing". www.librarything.com. ^ SKUENN (27 February 2012). "Edwards Award". ^ "That Summer Summary & Study Guide". www.bookrags.com. Retrieved 2018-04-04. ^ "Someone Like You – Sarah Dessen". sarahdessen.com. Retrieved 2018-04-04. ^ "Keeping the Moon Summary & Study Guide". www.bookrags.com. Retrieved 2018-04-04. ^ "Dreamland Summary & Study Guide". www.bookrags.com. Retrieved 2018-04-04. ^ "This Lullaby – Sarah Dessen". sarahdessen.com. Retrieved 2018-04-04. ^ "The Truth About Forever – Sarah Dessen". sarahdessen.com. Retrieved 2018-04-11. ^ Just Listen | Teenreads. ^ "Lock and Key – Sarah Dessen". sarahdessen.com. Retrieved 2018-04-11. ^ Along for the Ride | Teenreads. ^ Rebecca-books (2010-10-16). "Rebecca-Books: Infinity - Sarah Dessen". Rebecca-Books. Retrieved 2018-04-11. ^ "What Happened to Goodbye – Sarah Dessen". sarahdessen.com. Retrieved 2018-04-11. ^ "The Moon and More – Sarah Dessen". sarahdessen.com. Retrieved 2018-04-11. ^ "Saint Anything – Sarah Dessen". sarahdessen.com. Retrieved 2018-04-11. ^ "Once and For All – Sarah Dessen". sarahdessen.com. Retrieved 2018-04-11. ^ "I interviewed author Sarah Dessen, the woman who made me want to read and write". HelloGiggles. Retrieved 2018-04-18. ^ "The Sarah Dessen Interview".